Incontri in Terra di Siena is a not-for-profit cultural association, based at Villa La Foce in Tuscany, Italy. It was founded in 1988 by cellist Antonio Lysy and his mother Benedetta Origo in memory of Antonio Origo and his wife Iris, the well-known Anglo-American writer. After moving to the area in 1924, the Origos dedicated their lives to the development and progress of the Val d’Orcia and its people. 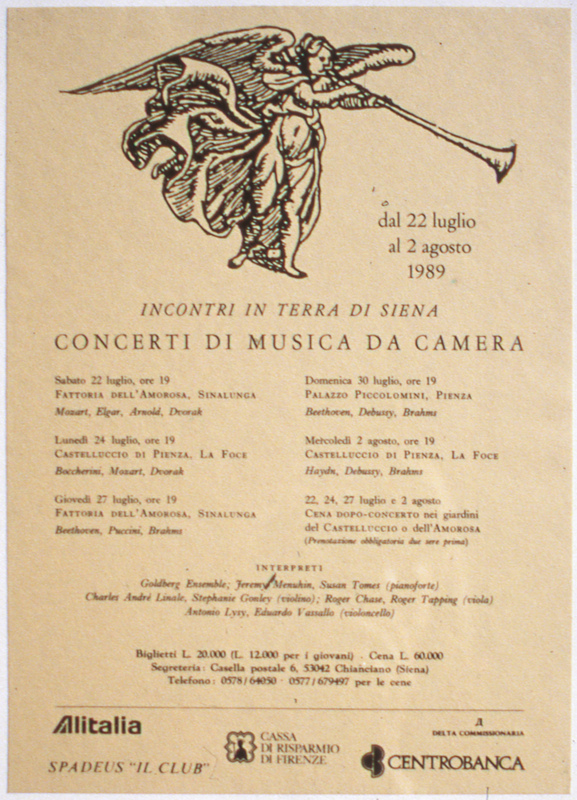 From the outset, the aim of the festival was to spread the appreciation of music and art through concerts, meetings, exhibitions and cultural events to be held in the many beautiful neighbouring towns of the Val d’Orcia such as Pienza, Montefollonico, Città della Pieve, Sarteano and Castiglioncello sul Trinoro. ‘Thirty years is a long time. I can’t imagine a summer without Incontri now. Looking through the colourful booklets of our past festivals, with so many exciting music programmes and nostalgic photographs, I am reminded of past friendships, growing children and grandchildren, difficult moments and joyful successes, memories of anxiety and hope, of change and continuity, that follow the course of our lives. Magical summer evenings of music in gardens, churches, villages and all the lovely places that welcome our concerts and moonlit dinners: Castelluccio, our home for thirty years (no longer ours now – a different world), the Fattoria dell’Amorosa, our historic partner from the very beginning, the mysterious Pieve di Corsignano at Pienza, delightful Montefollonico, enthusiastic Città della Pieve, the garden of La Foce – these are some of our public’s favourite venues. 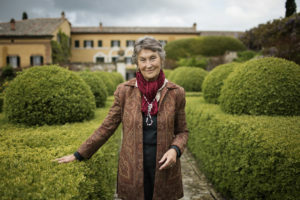 …La Foce and the Incontri could never have become what they are today without the Origos’ constant work to bring progress in the Val d’Orcia throughout their lives. Sergio Romano poetically remembers their dedication in his booklet, written in 1989 for Incontri, ‘La Toscana Conquistata di Antonio e Iris Origo’, that will be available again during the 2018 festival. Here too are some words by Yehudi Menuhin: ‘Incontri in Terra di Siena, perhaps the most loving and youngest of all festivals, joining the aspiring young of age to the still aspiring young of spirit. (…) And how comforting, at my age, to think that dear Antonio, his nurture so long in my hands, is their guide and director!’. 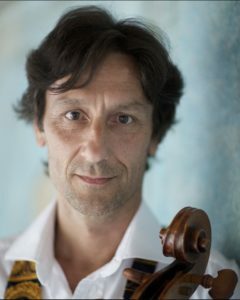 Grandson of Antonio and Iris Origo, Antonio is both an internationally-acclaimed cellist and current professor at UCLA, as well as being Incontri’s principal founder. In past seasons, he has invited renowned artists Pascal Rogé and Kathryn Stott to be guest Music Directors while inviting musicians such as Maurizio Pollini, Vladimir Ashkenazy and Maxim Vengerov to be on the Incontri’s Honorary Board. ‘If you have access to a slice of heaven that everyone dreams of experiencing, wouldn’t you want to share it? Since the earliest memories of inviting school friends to La Foce, it was always an aspiration of mine to be able to share this privileged setting with others – for its natural beauty, its history, its significance, and its magical ability to inspire. My grandparents were clearly seized by this same sensation when they first discovered the Val d’Orcia, seduced by its allure and seeing its promise even in such a barren state. The concert series started simply, idealistically, and yes, also for selfish reasons (I was just stepping out of college and into the profession). 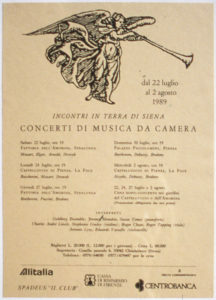 It was a means for friends and kindred spirits to unite and to contemplate the masterworks of chamber music in a peaceful retreat – albeit with the inevitable goal-driven incentive that all performers are guided by- and to present our art to an appreciative audience at the highest possible standards. The circumstances couldn’t have been more ideal. Besides the loving tribute to my grandparents and to the remarkable philanthropic work they achieved in the region, the Incontri’s inception was a breath of fresh air in the valley, presenting something new, stimulating and relevant through music and art. The festival developed quickly and attracted an enthusiastic following thanks to the indefatigable efforts of my mother, our founding members, our many supporters around the world, the stream of masterly artists, the press, and the tireless team of individuals who still give their time and skills to its management today. The participation of the Locanda dell’Amorosa along with neighboring towns and ‘borghi’ introduced an itinerant flavor to the series, broadening the Incontri’s inclusive experience and adding a unique romance and charm. Unbelievably, one executive committee member –Alfiero Mazzuoli-has not missed a single event in all these years. Thirty years on, the Incontri has not only achieved its place on the international stage, but is indelibly rooted in the fertile soil of the Val d’Orcia. For those few fleeting yet splendid summer nights, it has become the spirit and soul of the valley. Let’s look ahead together to many happy returns, hoping to share with you, our devoted public, many further magical opportunities’. 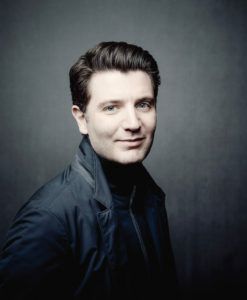 Pianist Alessio Bax became Artistic Director of the Incontri in 2017. Combining exceptional lyricism and insight with consummate technique, Alessio is without a doubt ‘among the most remarkable young pianists now before the public’ (Gramophone). He catapulted to prominence with First Prize wins at both the Leeds and Hamamatsu International Piano Competitions, and is now a familiar face on four continents, not only as a recitalist and chamber musician, but as a concerto soloist who has appeared with more than 100 orchestras. ‘There are many excellent music festivals in the world, but I find that those which are truly successful and long lasting have their own clear identity. Incontri in Terra di Siena is one of these. While the connection that Incontri has with the surrounding land is undeniably strong, it is the unique history of the place and the eclectic mix of people supporting the festival that have made it what it is. This goes well beyond Italy as a country in the true spirit of art, music, friendship and beauty. Immersed in the magnificent setting of La Foce and of the Val d’Orcia, our world class musicians manage to create, year after year, something truly special and quite unique. It is almost as if the great music created at the Incontri belongs to the land, enhancing its beauty and leaving us, as audience members, with truly profound and gratifying experiences that stay with us for a very long time’. Marella Agnelli, Vladimir Ashkenazy, Paolo Baratta, Colin Firth, Maurizio Pollini, Gioacchino Lanza Tomasi, Maxim Vengerov. Benedetta Origo (President), Fulvia Mazzuoli (Vice President), Anne M. Bauer, Geneviève Brion, Giovanna Lysy, Alfiero Mazzuoli, Carol Van Wonterghem. Nancy Bertrando, Suzanne Deal Booth, Michael Cioffi, AMB Robert Gosende, Katia Lysy, Benedetta Origo, Bruno Santonocito, AMB Urs Ziswiler.